I always look for new bourbons to try and I saw this on the shelf while picking up some libations for the holiday season. Which of course is how I ended up bringing this bottle of Beer Barrel Bourbon home. Needless to say, once I had it home, I had to try it. I am always hopeful when I try a new whiskey that it is going to do that magical thing in my mouth that makes me fall in love with. 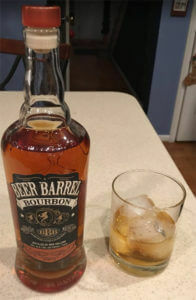 So how did Beer Barrel Bourbon do? The first neat sip was a bit rough and let me down. I then poured it over ice and those rough edges softened up. There is still a little harsh edge on the edges of my tongue, but the ice opened up the caramel and roasted grains. After finishing a tumbler, I was left with a better impression than the first sip gave me. I will drink the rest of this bottle, and I would buy another, but it won’t be a go to whiskey for me. It will be reserved for those times when I just want something different, or quite frankly, just need a drink after a hard day at work. Overall this is a decent whiskey when on the rocks, but it doesn’t hold up to some other $35 dollar options. This $30 to $35 dollar segment is a very competitive segment, and Beer Barrel Bourbon is going to need to step up if it wants to do better than a 66/100. Decent bottle to share with whiskey newcomers.